Andrew is the principal and founding director of Better Health. 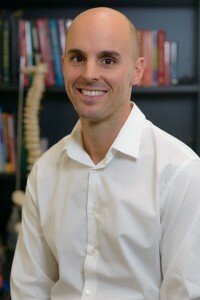 Andrew graduated from Sydney University with a Bachelor of Medical Science in 1995 and followed with a Master’s Degree in Chiropractic from Macquarie University in 1998. He has now been in private practice for 20 years. Andrew’s holistic view of health has been the unique driving force behind the collaborative approach our professionals have at Better Health. He has pursued extensive post-graduate studies in the areas of functional neurology and orthopaedic rehabilitation. The nature of his approach sees him working closely with people from all walks of life who are looking for natural and integrative approach to their health concerns. Aside from time spent in clinical consultation Andrew works regularly as a presenter within the chiropractic, allied health, early education and high school as well as fitness industries. Andrew’s belief is that the practice of health care is a personal journey that starts in the home. The practice at Better Health is the expression of a personal value and approach to health care that extends from this. He is the proud father of 4 children and together with his wife Yvette shares a common love for a healthy and active outdoor lifestyle.